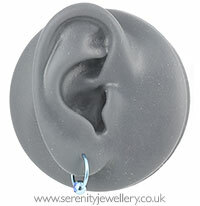 Hypoallergenic titanium BCR (ball closure ring/captive bead ring) with jewelled clip-in ball. Compatible with 5mm clip-in accessories. Bought this earing for my helix piercing and it was easy to fit and the ball slipped on with ease. only thing I will say is that for me the loop was a little large so doesn't look quite how I had hoped so if you are after a snug fit look at some of the non-jewelled products as the loop sizes vary unlike this one. I first found it hard to get the ball in, however I have got the hang after a couple of goes. I'm using them in my earlobe and the thickness of the ring is more than regular earrings, but I got it in OK.
Love these titanium earrings, no sensitivity problems at all, and they look good too. 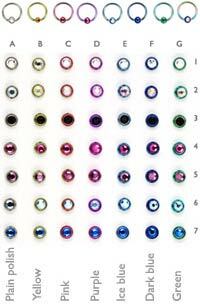 These look lovely but the rings are so thick that they won't fit through the holes in my ears. Disappointing. I found it really hard to get the small ball inbetween the hoop! 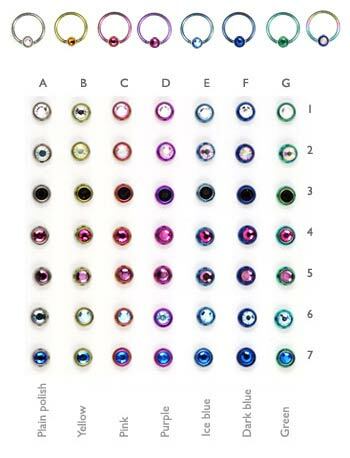 These are beautifully coloured BCRs which have a feeling of harmony and balance and are extremely comfortable to wear. They are dynamic but understated, so they perfect for (male) earring wearers for whom there is not always much choice/originality out there. 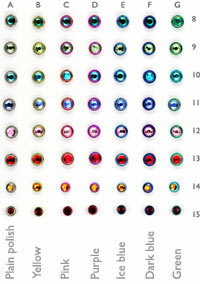 The only difficulty I found was choosing from the vast array of colours. Great everyday earrings at a bargain price. Easy to get in and out, comfortable to wear. I was also impressed at how rapidly these were delivered to the small Greek island where I live.